The twelve days of Christmas in the title does not refer to the traditional Christmas season - not exactly. It refers to something that I have not had since the late 1980's - Christmas week off! This is a feature of my new job, the company closes for Christmas week; Christmas eve through New Years. Because of the arrangement of Christmas and New Years this year, by adding a vacation day on Jan. 2, I can get 12 days off! 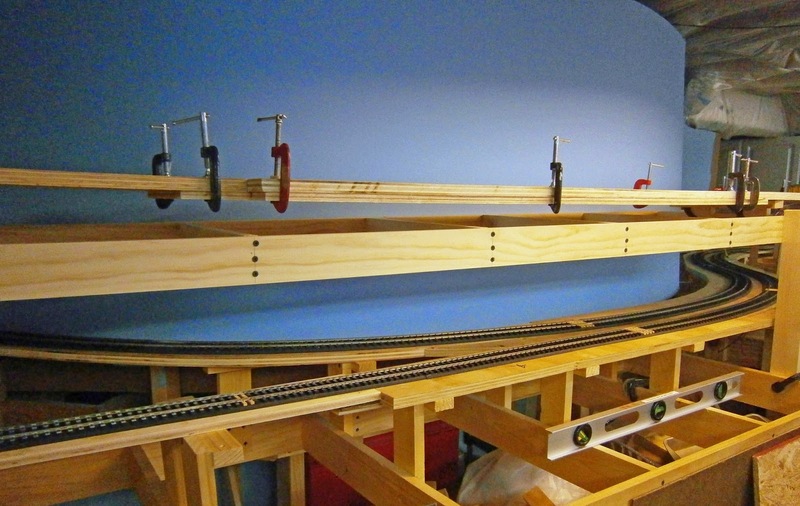 I've been looking forward to this for months as an opportunity for intense work on the layout. Unfortunately I'm batting less than .500 on days in the basement - way less. However, progress has been made nonetheless. 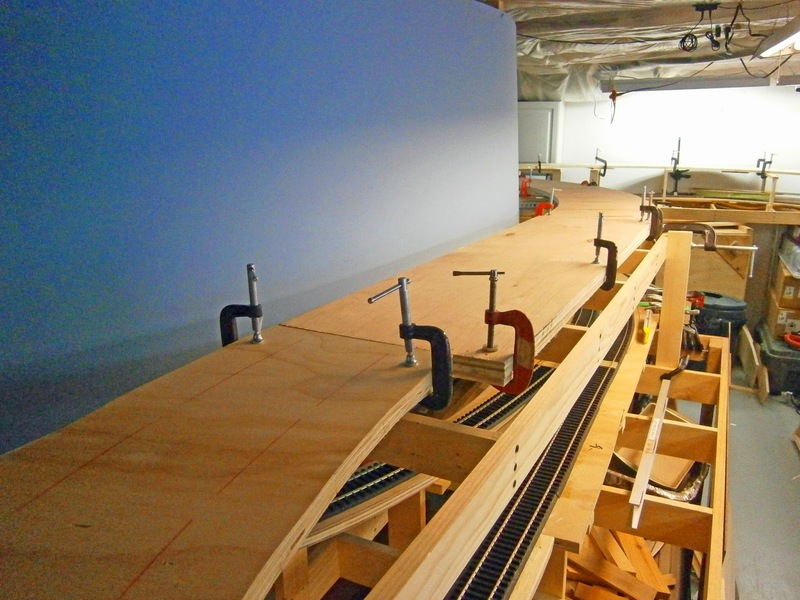 Today, the final piece of subroadbed for the main line went into place. Graveyard curve (so named on the B&O as the location of an actual graveyard) now connects with the top of the helix. 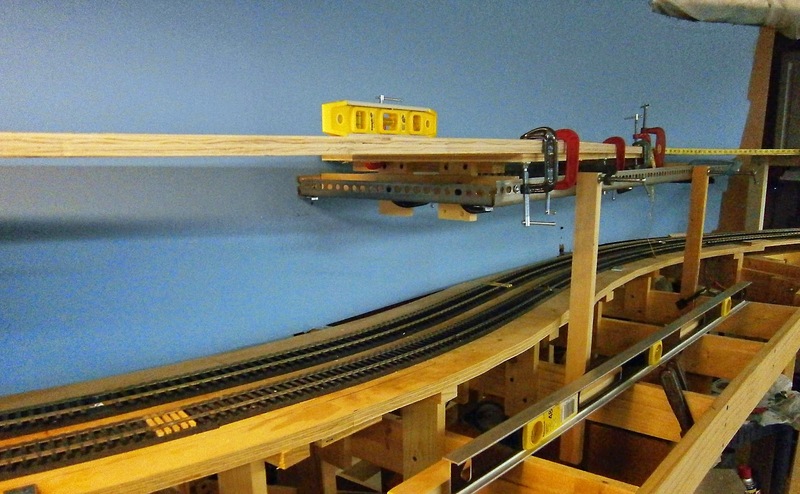 When track is installed, a complete circuit of the mainline will be possible. 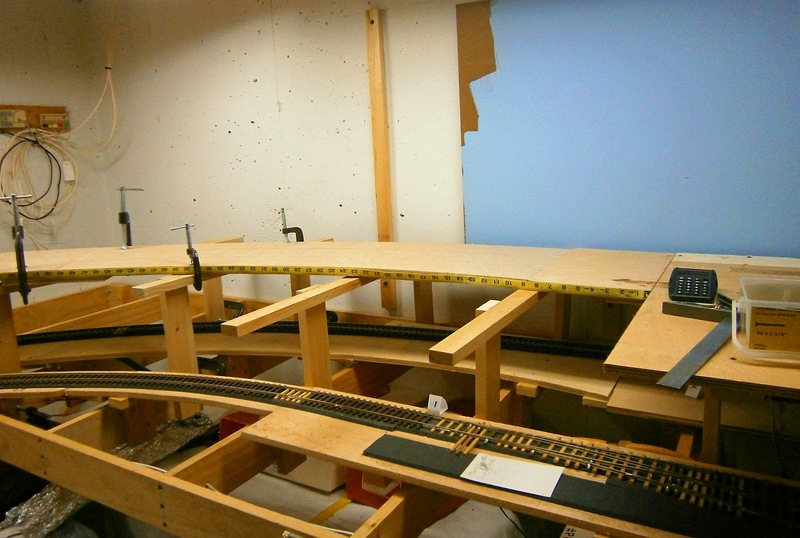 The only significant part of the layout not yet started is upper staging - which replaces the upper return loop in the original plan. That's camper tape in the foreground, which is the first layer of my roadbed. Further back you can see cork roadbed on top of the camper tape. Continuing downgrade, that's my workbench and cabinets in the background. They'll be hidden by the backdrop. 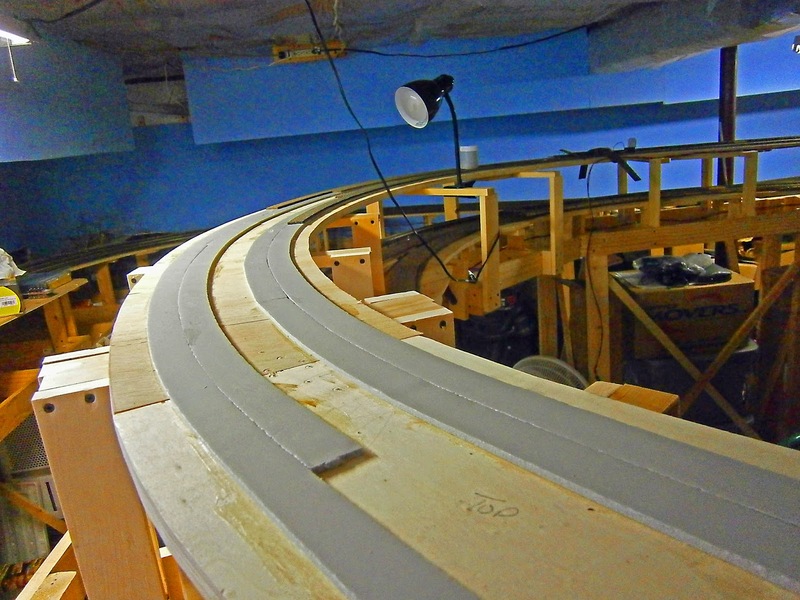 Continuing around Graveyard curve; which at this point is at final grade and ready to begin to receive roadbed and track. I took these shots standing on a step stool. 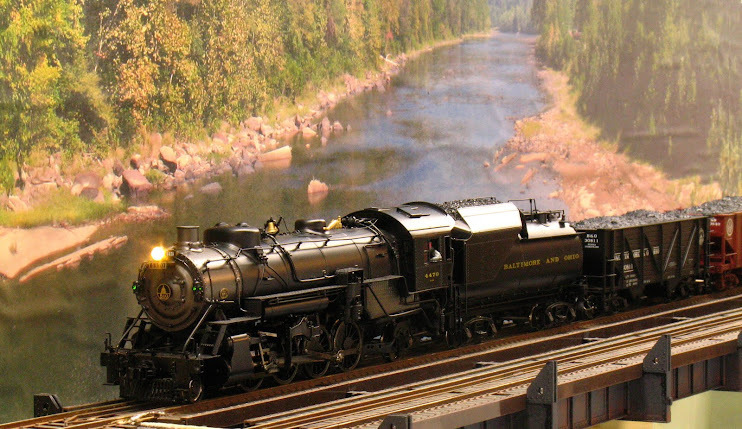 What's not apparent is that this roadbed is above the sweeping "S" curve that leads into lower staging. 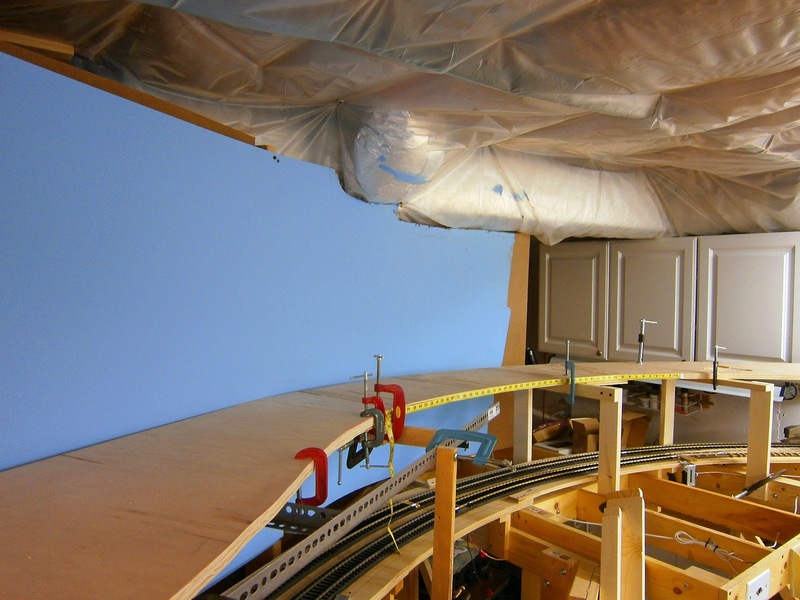 Several of our local group have encouraged me not to cover this graceful curve so I have been trying to devise a support structure for the upper track that does not obscure the lower level. I've built and rebuilt the support structure at least twice. 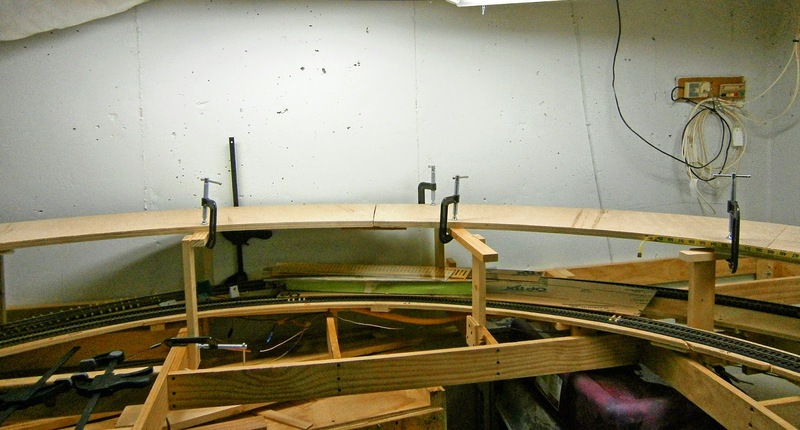 I started with 1x4 framing - much too thick, the lower track appears in a narrow slit. 1x3 framing was not much better. On another section I tried to experiment with a framework made out of 1 1/2 inch slotted angle. This was better, but not what I'm searching for. 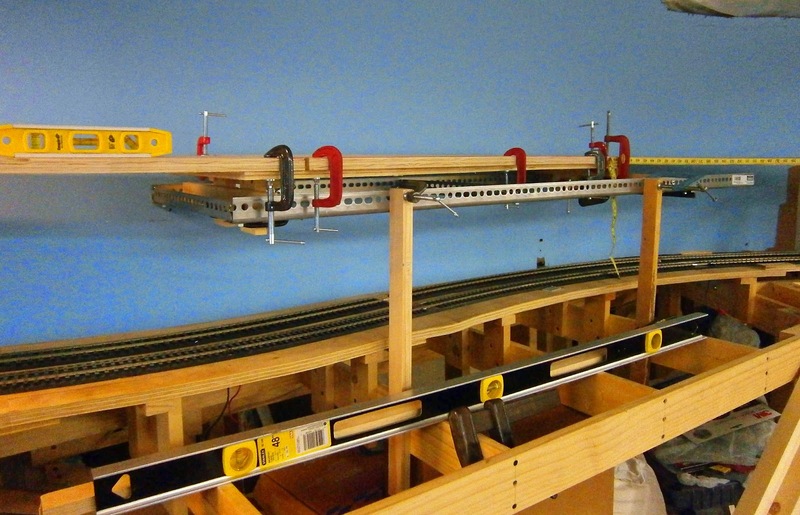 Here are some photos that make the lower track more prominent. The camera's wide angle setting makes the opening for the lower track seem more spacious than it is when viewed in person. 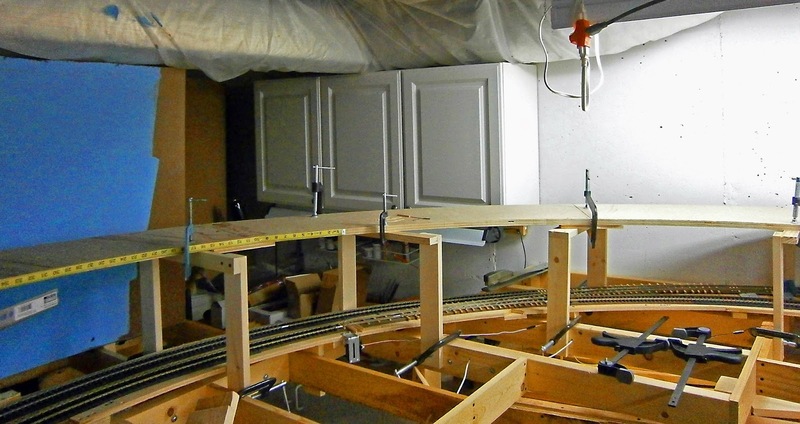 The 1x2 lumber holding up the front of each section supporting the upper subroadbed would be removed after the grade was established, the track laid and suspension wires tied to the floor joists above. As I said, I'm not happy with this arrangement, but I have an idea for a thin subroadbed built along the principles of a through-plate-girder bridge. Stay tuned for how it turns out.